All Saints on the Christian calendar is a “High Holy Day”. In Roman Catholicism it has a very clear purpose – the remembering of All Saints which are those who have official church recognition. In Lutheranism, or Protestantism in general, it sometimes seems to be a day looking for a firm meaning. Some Lutherans just bring over the Roman Catholic idea which they are free to do following the Augsburg Confession article 21. Some, perhaps most, let it pass without mention other than singing the Hymn For All the Saints, which is one of the strongest in the book. As such it can be a gauzy day sometimes bordering on ancestor worship. My take has been to turn All Saints into a festival of the church akin in Pentecost with a slightly different focus. Pentecost tends to focus on the Work of the Holy Spirit which often turns to missions. All Saints turns more to the result of those missions – the life of the body of the church. The hymns hold before us mostly the vision of either the church at rest (those who have died) or the church triumphant (the New Jerusalem). The missing element is often the church militant i.e. us. So that is what I try to do with All Saints, remind or meditate on the now and the not yet of the life of the church. Now we are the Children of God. But the fullness of the Kingdom is not yet made manifest. Not even for the Church at rest who continue to ask “How Long?” (Rev 6:10). The goal is to see the unity of the church in Jesus Christ. This sermon, because it is John I grumble, flips the normal outline. Paul and Lutherans are much more comfortable experiencing our fallen nature and sin and looking to Christ as our savior. A progression of law to gospel. John holds a vision before our eyes. We are now the children of God. Any troubles we have, the existential problems that cause Paul and Luther anguish, are mere trifles to John and that vision. He doesn’t deny them, but each time turns our eyes back to the prize which is God. That is what this sermon attempts to do. And that view might actually make more sense for a day when you are admitting new kids to the sacrament. With Paul or Luther, once you find a solution to the existential problem, the pressure can be off so to speak. (Insert joke about confirmation and bats.) 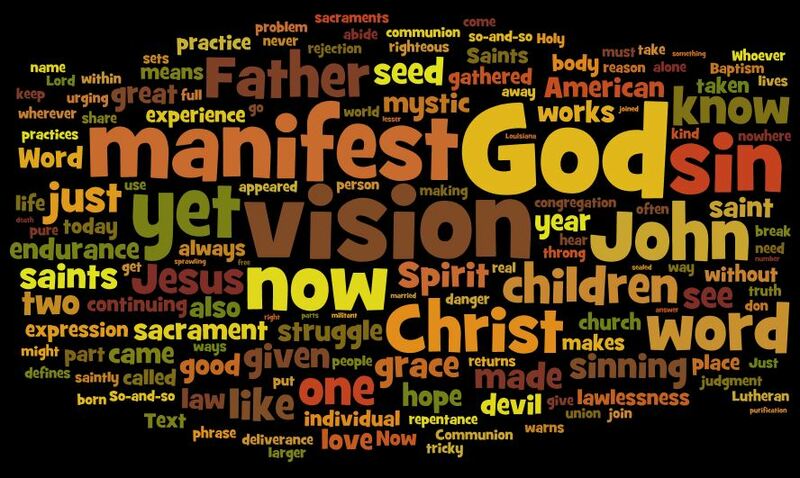 With John we are never at the manifestation of the vision in this life. We experience the now and the net yet of the Christian life more fully. The joy which is now ours and the pain of it not yet being completed. So, I’ll admit this is dense, but I also think it is worth of listen or a read. The saintly calling of vision and endurance in the midst of the great multitude.